San Diego World Affairs Council - Three Elections and a Brexit: The Unraveling of Europe? Three Elections and a Brexit: The Unraveling of Europe? There will be a $45 charge to attend this event. RSVP here by October 5. 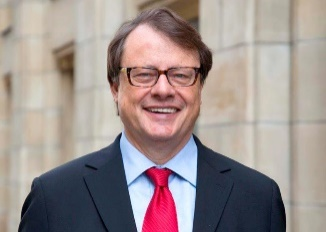 A former German Ambassador to the United Kingdom, the United Nations, and India, Ambassador Thomas Matussek is currently a Senior Advisor at Flint Global in Berlin. He previously headed the public-policy representation of Deutsche Bank in Berlin and was the Managing Director of the Alfred Herrhausen Gesellschaft, the International Forum of Deutsche Bank. Early in his career, he served as Special Assistant for Europe to Federal Chancellor Helmut Schmidt. He was the Director General of the German Foreign Ministry and held senior staff positions with Foreign Minister Hans-Dietrich Genscher – when he was deeply involved in negotiations on German unification – and with Foreign Minister Klaus Kinkel, when he worked toward a solution to the Balkan crisis. As Permanent Representative and Ambassador to the United Nations in New York, he negotiated the first four UN resolutions on the Iranian nuclear issue, which became the foundation for the so-called 3+3 Iranian nuclear deal, accomplished in 2014. Ambassador Matussek sits on a number of boards, including the Deutsche Gesellschaft für die Vereinten Nationen (United Nations Association of Germany); Institute for Strategic Dialogue in London; Internationaler Wirtschaftssenat e.V. (World Economic Council) in Berlin; and Aspen Institute Germany. Abstract: The historical promises of European integration, peace, prosperity, and a powerful voice in a globalized world may have lost some of their appeal. War to the east, economic and social meltdown in the south, millions of refugees, and xenophobia and nationalism led to Brexit, Le Pen, and the Alternative for Germany (AfD), but have the elections in the Netherlands, France, and Germany been turning the tide? Is Europe finding its way back to the idealistic visions of its founding fathers?